Euro Rail Hobbies and More Blog: Fisher Bahn II ....Track Plan. 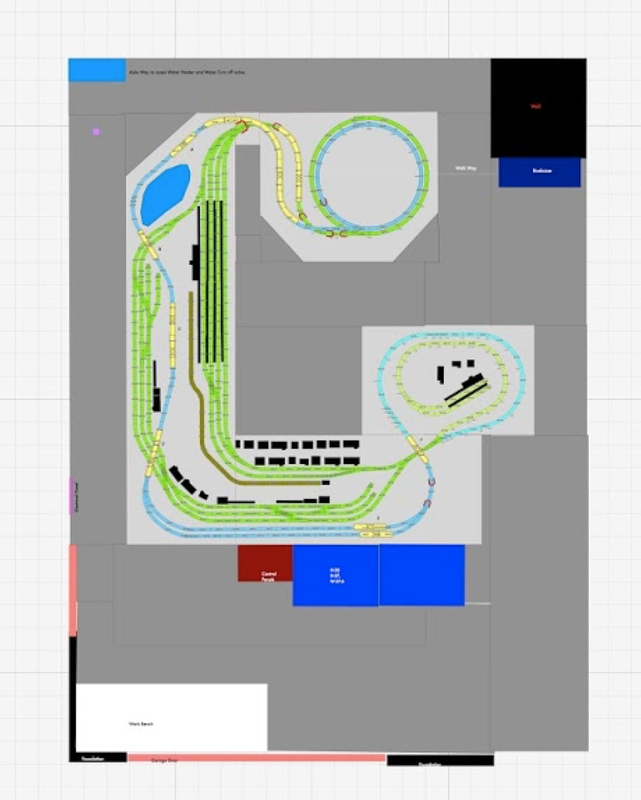 Please see previous posts for priorities regarding this track plan. Background: This plan was a simplification of my previous layout. The "evolution" of this plan required about 1.5 years, several "trial" track plans, multiple iterations of each plan, lots of patience and tapping to that experience mode so not to make the same mistakes twice ! Planning emphasis focused on interesting dioramas throughout the layout, seeing multiple trains at once, lots of activity in the Bahnhof, a helix and visible staging yards. Blue track: elevated track 4" above main level. Maroon box: sliding shelf for Central Stations. Blue Boxes: Storage cabinet which fit under the layout and upon which transformers and boosters will be located. Dark blue box RUQ : book shelves. Salmon line: garage door and door to RV platform.